Our collaboration with IS Helpline has looked to continuously improve IT help provision at the University in an effort to facilitate self-service by users. Our latest endeavour has focused on the student card process. Getting a University card is one of the most important tasks for new students – it’s what allows them to borrow books at the Library, access buildings and take advantage of student discounts. 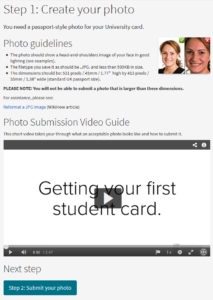 It’s also a process that can cause a lot of overhead for the Card Services team who coordinate this – specifically, in cases where students don’t submit photos that comply with guidelines. In these instances, Card Services staff have to get in touch with each of these students to ask for a new photo. 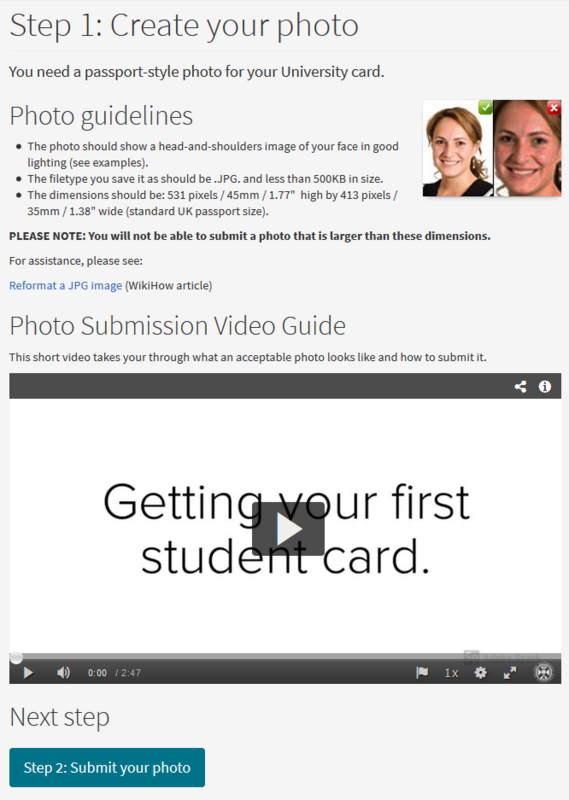 The most common submission problem is when students send photos that don’t have a head-and-shoulders crop, a white background or are the wrong size. 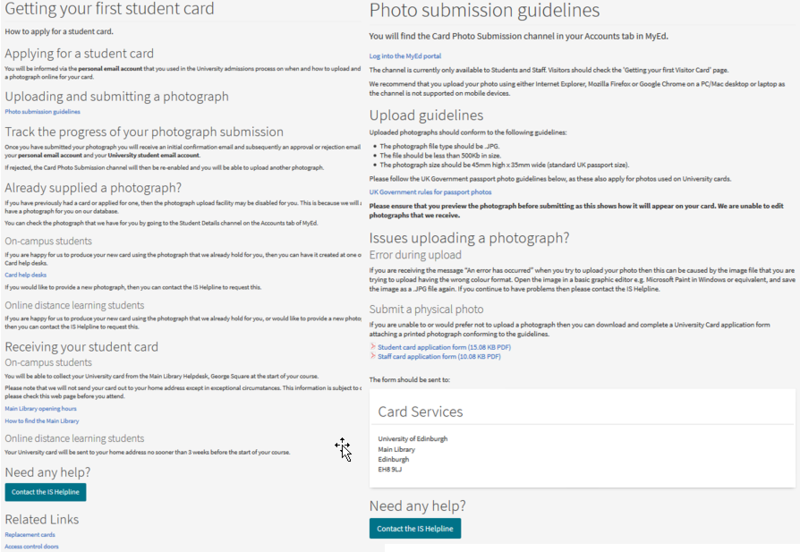 The Card Services team create thousands of cards each summer, so dealing with photo submissions that don’t comply with these guidelines can add a lot of extra work. 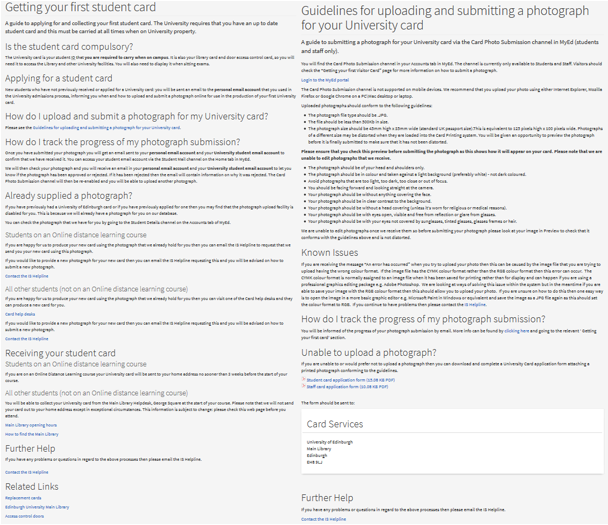 Earlier this year, we had worked with Card Services looking at student experiences with and attitudes towards personal versus ID photos, and how these perceptions influence the photos they submit for their card. This summer we focused on enhancing the card pages to make sure students could easily understand the card process. The card pages in 2016 before we had done any work on them. The card pages in 2017 (and the pages we tested on). We had done some initial edits on these pages last summer. 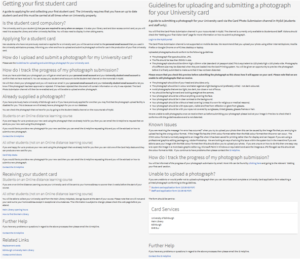 For example, the first link on the original Getting your first student card page was called ‘Photo submission guidelines’, which took you a page that listed the guidelines and where to upload your photo to. However, you had go back to the original page to find out how to collect your card, but this action was not mentioned on the submission guidelines page. To address these issues, my colleague Gavin from the IS Helpline and I worked to turn the content into a series of step-by-step pages. Step 1 of the redesigned card pages. Usability testing task success: Re-doing the same testing with 3 different students resulted in 8 task successes and 1 task failure – a massive improvement from the previous testing. 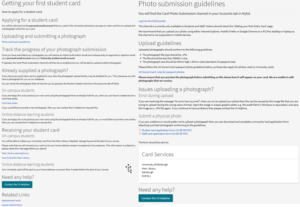 20% increase in early card production: The Card Services team were also able to pre-make more cards before start of term this year, which can be done when students send in photos that comply with guidelines in time. This year, the team pre-made 12,842 cards, up from 10,687 in 2017. All the changes we made in this project were to the content – we didn’t make any technical enhancements to the CMS to get these results. No fancy gimmickry or technical work can fix any problem if the content isn’t already in good shape. Put simply, you get results when you create user-focused content that’s clear and concise. Lauren gets great results by helping you understand your users’ needs and then crafting quality content they can easily engage with. If your department could benefit from a similar process of reworking your content and getting a grip of your website, get in touch.